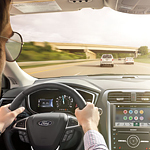 Ford Fusion Helps Create Better Drivers | Mills Motor Inc. Brake Coach is a configurable screen within the SmartGauge with EcoGuide. The Brake Coach automatically displays when you bring the Fusion to a full stop. The Coach helps you brake in a manner that restores the most energy to the regenerative braking system. Over time, you become accustomed to braking in a way that is most energy efficient. Brake Coach can be disabled in the display section of the settings menu. Surf, stream or download inside the cabin of the Ford Fusion, thanks to FordConnect Pass. This feature creates a Wi-Fi network inside the Fusion. The network boasts AT&T-powered 4G LTE speeds, a 50-foot signal radius and compatibility with up to 10 devices simultaneously. Experience the Fusion for yourself. Visit our Ford showroom today for a test drive.